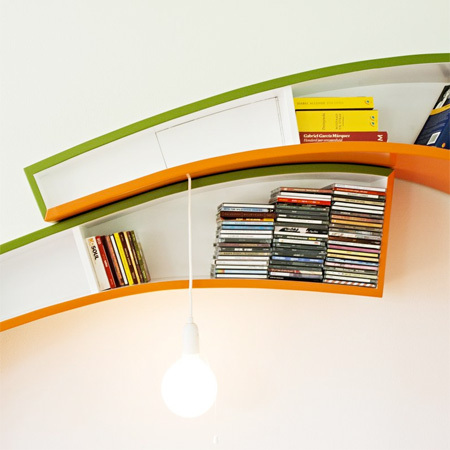 Unique chair made of bookshelves designed by Dutch studio Atelier 010. 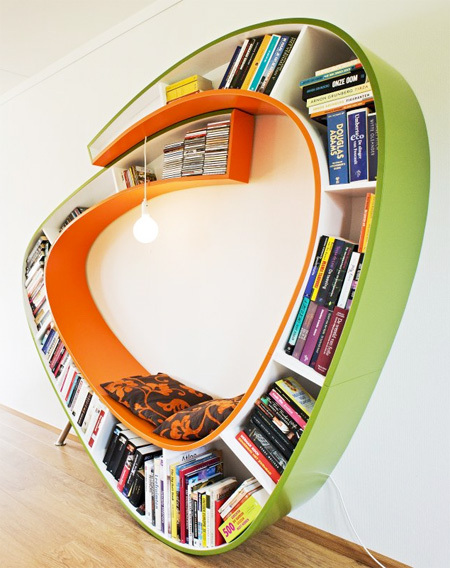 Curved bookshelves wrap around and form a chair where people can sit, relax, and read their favorite books. 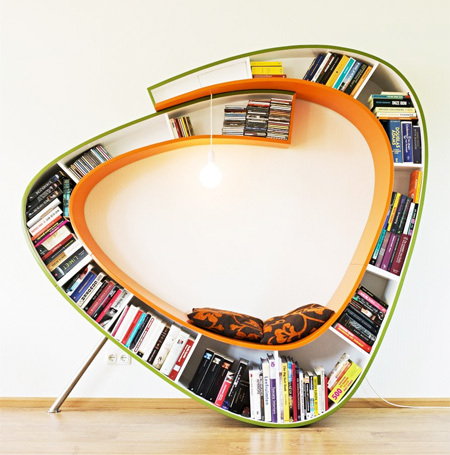 Bookworm Chair is equipped with comfortable pillows and a lamp. This will soon be like the telephone chairs of the 50s. With my Kindle all I need us the chair. @Cheryl People still read regular books, it’s a different experience than with the kindle. The analogy isn’t correct in my opinion, since it’s not about technology evolving in this case. Very Stylish but I don’t think having your back against the wall would be particularly comfortable and the inside doesn’t seem padded… you could use pillows but I think it needs tweaked. 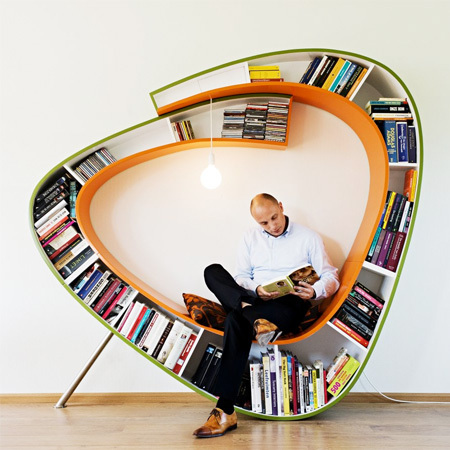 Forget about the bookworm chair! Did you see the three leg chair in the background? Love it, anybody knows what it is? Lots of people still read printed books. I work in a bookstore so I guess I should know. :) The experience of reading (and owning) something printed on paper will never be replaced by technology. I do read books on my iPhone, but I certainly prefer printed literature. On another note, I want this chair! Doesn’t look very comfy but the design is gorgeous! I own a Kindle as well as books, though almost all my literature purchases nowadays are for my Kindle, unless it is a special print of one of my favorite books. I have a good amount of books I could fill that chair thing with though. It’s a very cool looking chair, and will probably super comfy if it was a little deeper, and padded. I could see myself curling up in it with my Kindle, a book, a laptop, or maybe to just watch TV. It’s like a little nest. I also think it would be cool if the lamp was maybe recessed in the chair, or adjustable instead of just on a string. 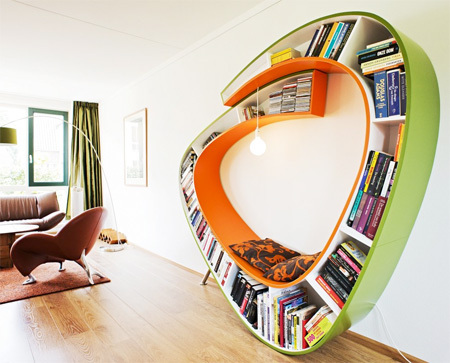 Also, maybe one of the shelves could be open inside of the chair so you can stick your things in it while you read. Does it have to lean against a wall? 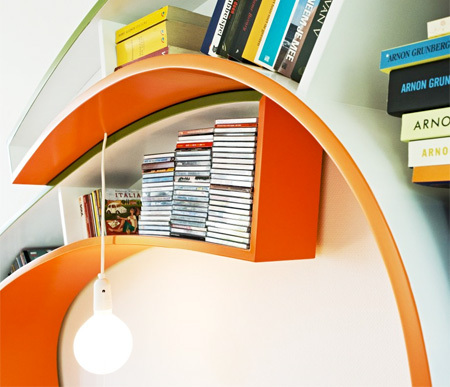 I think it would look cool as a free-standing shelf, used as a room divider. People saying “but who buys books any more?”, you could store other stuff on the shelves. It would look pretty cool packed with brightly coloured clothes or soft toys. Loved it! Would look great anywhere! @nerd: lots of people. Me, for one, although I own a kindle. I still buy books by the ton and prefer them. When you truly love reading, it’s difficult to replace books with gadgets.